This record consists of two EPs. One side is "Silver Cities" produced in 2010 and the second side is "Ruby, I'm Changing My Number" produced in 2009. All the covers are hand screen printed, numbered and signed. Current colors are aqua, blue, orange and silver. Comes with a download code for a free digital copy of the album in WAV or MP3 format. 160 copies pressed. "We Fell Dead" remixed/covered by four awesome bands and DJs. Start the party by falling dead. 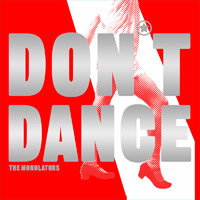 The third and newest full-length album by The Monolators, from 2008. This 12" vinyl record comes in a signed and numbered cover, each hand screen-printed by Eli and Mary Monolator. Every run of 40 has a new color scheme. Current colors are red and silver. Comes with a download code for a free digital copy of the album in mp3 format. 300 copies pressed. 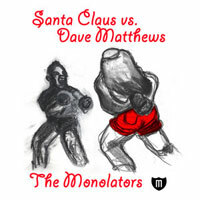 The second EP by The Monolators (the first one is long out of print), from 2007. Pressed on extra-thick 10" vinyl, each copy comes with a download card for a free digital download of the EP in mp3 format. A very special 7" 45 rpm single from 2005. Pressed on swirly grey vinyl. The original idea was to have contrasty black and white swirl to represent stars and outer space, but instead it just came out kinda in the grey range. Oh well! This record has a large center hole and is ready for your jukebox. You got a jukebox, right? Sure you do. Cover art, as always, by Eli and Mary Monolator. Another very special 7" 45 rpm single, this time from 2003. This is our holiday-themed single. It's pressed on wonderful clear red vinyl with a large center hole. Neither track is on any of our albums. 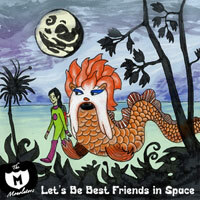 The B-side is a spoken-word greeting from Mechanor the lovelorn giant robot, as voiced by Hugo Armstrong. Really! Only 100 copies pressed and nearly all gone, but we still have a few copies.